The class is relaxed, fun and caters for up to 6 crafters. Please note there is only stairs to the second floor where the toilets are situated in the building and no disabled access. We will be crafting in the kitchen area which is light and perfect for Summer crafting. A requested class following four years of Christmas wreaths. This class provides you with the inspiration make wreaths for any season of any shape. We will be making a wreath in the Crafternoon from the supplies available. 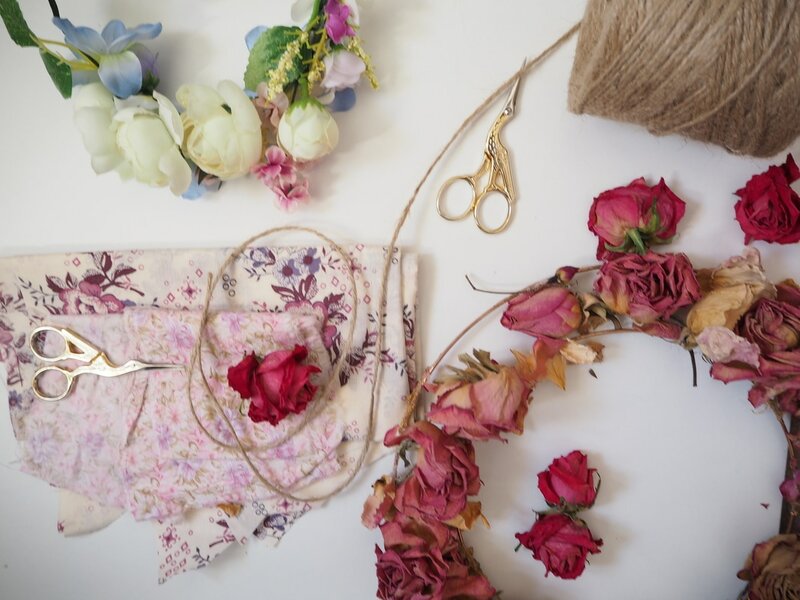 Choose to start with various wreath bases and decorate with faux flowers, dried flowers, vintage fabrics using crafting techniques and floristry combined. The aim of the class is to take your inspiration to decorate a wreath for any time of year for any occasion! We will be providing the templates, the design is up to you! Also we include pretty embellishments including ribbons, buttons and fabrics. Take your own creativity home at the end of the session. Any level, no prior knowledge needed. If you are experienced we have techniques for you too! All materials are provided including tea and cake. Will I finish in the class? We aim to finish in the class but you can take your work home if you wish so you don't rush. Yes, the class is suitable for 10 yrs+ but accompanied with an adult. The price is non refundable but you can pass your ticket to a friend if you cannot make it. Please check you can make the class before booking. To book CLICK HERE or contact Samantha by phone 07881 613955 or by email info@crafternoonteahostess.co.uk . Bookings taken by BAC's or cheque.